For several months, the American Suppressor Association has been working with the Louisiana State Police (LSP) and Governor Bobby Jindal’s office to establish a statewide system in which NFA applicants in Louisiana would receive a Chief Law Enforcement Officer (CLEO) certification. 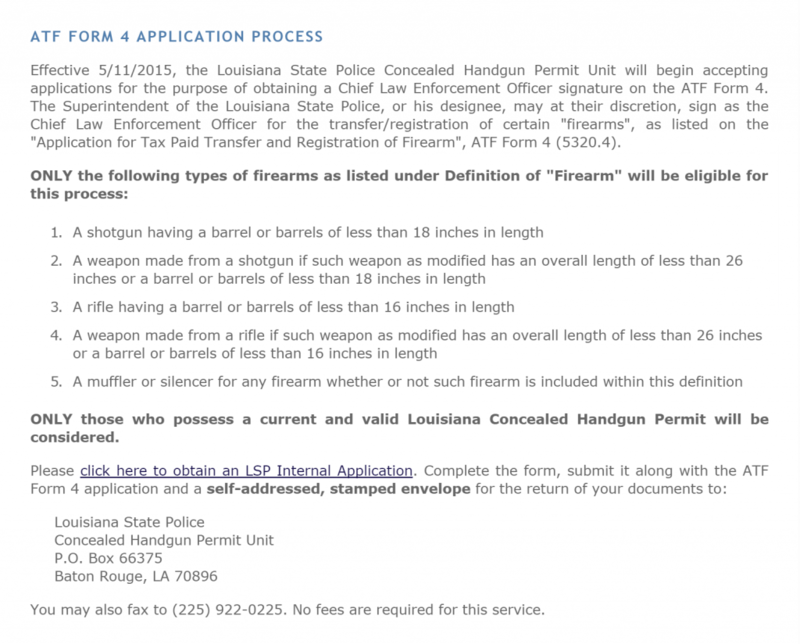 Today, we received word that starting Monday, May 11th, LSP will begin providing signatures for suppressor, short barreled rifle, and short barreled shotgun ATF Form 4 applicants who possess a valid Louisiana Concealed Handgun Permit. The CLEO signoff issue became a top priority for the American Suppressor Association following the Obama Administration’s Notice of Proposed Rulemaking, Docket No. ATF 41P. This is the executive action which seeks to extend the CLEO signoff requirement to every member of every NFA trust and legal entity. Many CLEOs refuse to sign NFA applications, basing their refusal on perceived liability or on purely political reasons The LSP’s application process is a major step towards ensuring that law abiding citizens in Louisiana have a way to receive a CLEO certification within a reasonable amount of time, regardless of the outcome of 41P. We thank the Louisiana State Police, and Gov. Bobby Jindal and his staff for taking this step to protect the rights of law abiding citizens in Louisiana. We also thank the National Rifle Association for their involvement and unwavering support of this issue. As always, the American Suppressor Association will continue to work tirelessly to ensure that your suppressor rights are protected and expanded nationwide.